The Environmental Protection Agency on Wednesday barred journalists for the second consecutive day from attending a national summit focused on water contaminants, telling reporters from CNN and other news organizations that they would not be permitted inside the venue. "Oh, you're not allowed today," a uniformed security guard told a CNN reporter when the journalist presented his credentials. "They ain't doing the CNN stuff. What's this, the press?" Other reporters, including those from Politico and E&E News, a publication that covers the energy and environment, were also turned away at the door. Jahan Wilcox, spokesman for the EPA, said in a statement that the event did not fall under a federal law requiring that certain meetings be open to the public. "The National Leadership Summit on PFAS scheduled is not a federal advisory committee event," Wilcox said. "The purpose of this event is for EPA's state, tribal, and federal government partners and national organizations to share a range of individual perspectives on the Agency's actions to date and path forward on PFOA/PFAS. The Agency looks forward to hearing from all stakeholders on these crucial issues." It was not immediately clear if any other media outlets were permitted inside, and Wilcox did not respond when asked if the session was closed to all press. Carrie Budoff Brown, editor of Politico, said in a statement that her publication "would much rather be writing about the agency's efforts to address this health problem than about reporters being excluded." "The summit was focused on an important public health crisis that has affected drinking water supplies across the country, and chemicals that are present in the bloodstreams of nearly all Americans," she added. "We believe it is important that the news media have access to the entirety of this discussion to keep the public informed with fact-driven, accountability coverage of this important issue." On Tuesday, the EPA blocked several journalists, including those from CNN and the Associated Press, from entering the venue when Scott Pruitt, the agency's chief, was speaking. Only those journalists specifically selected by the EPA were permitted to enter the premises. The Associated Press reported that when one of its reporters protested on Tuesday and asked to speak with a public affairs person after being told by security she wouldn't be permitted inside, she was physically shoved out of the building. A CNN photographer witnessed the incident as well. Wilcox blamed Tuesday's barring of journalists on space limitations, saying in a statement at the time that the EPA provided a livestream of the event to those interested, and that the agency was only able to accommodate 10 reporters -- an assertion disputed by reports in other media outlets, which said that there were vacant seats in the room. 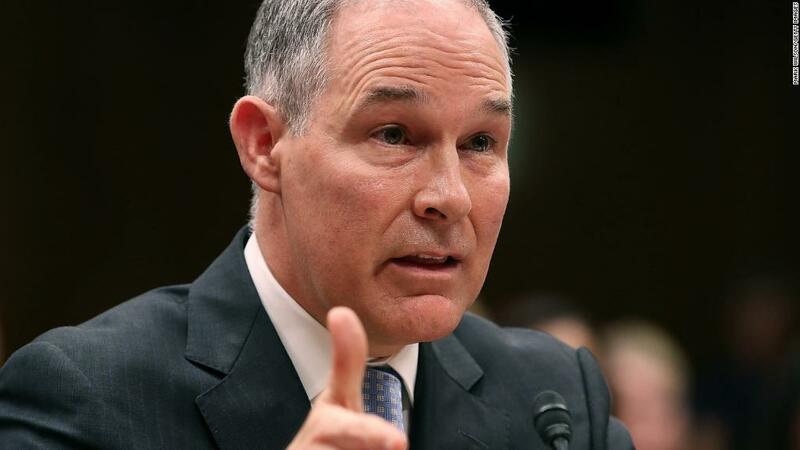 Following media scrutiny, journalists were invited to attend the second portion of the summit, which Pruitt did not participate in. Asked Tuesday evening about the incident in which an Associated Press reporter was physically shoved, Wilcox told CNN in an email that the news outlet had previously been told the event was "at capacity." "The AP reporter showed up at EPA but refused to leave the building after being asked to do so," Wilcox added. When specifically asked if he thought it was proper for the journalist to be shoved out of the venue by security, Wilcox did not reply. CNN, the Associated Press, and E&E News all released statements Tuesday condemning the EPA's actions. Sally Buzbee, executive editor of the Associated Press, called the move to block journalists "a direct threat to the public's right to know about what his happening inside their government." CNN added in a separate statement, "We understand the importance of an open and free press and we hope the EPA does, too." Less than two weeks ago, CNN aired a special report, "Pruitt Under Fire: The Battle at the EPA," about the various scandals plaguing the federal agency.